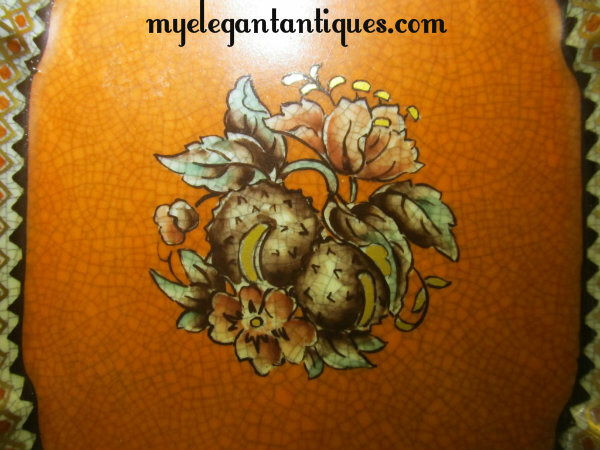 We are featuring a large and lovely example of Dahl Jensen Crackleware, Item No. 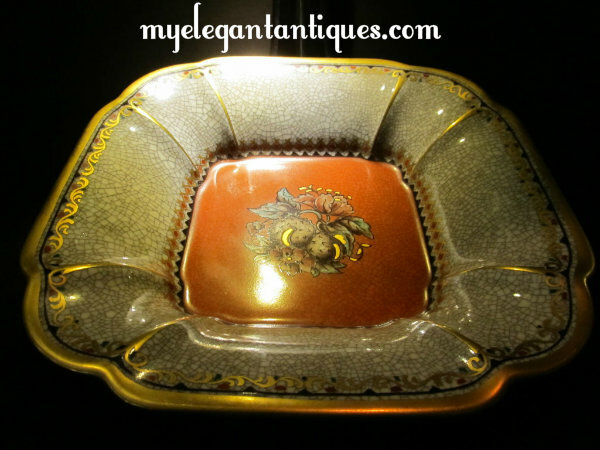 188-617, a square decorative or serving bowl with a red overglaze center and gilded flowers. 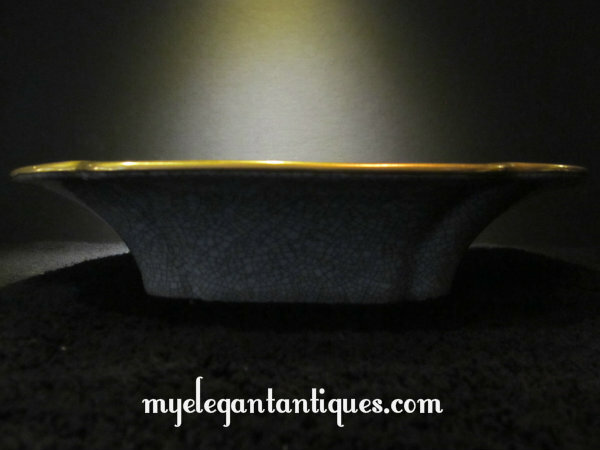 The body of this luscious dish is done in a gorgeous grey crackle glaze with an elaborate gilt, black, red and green stenciled design at the bowl's rim and verge. 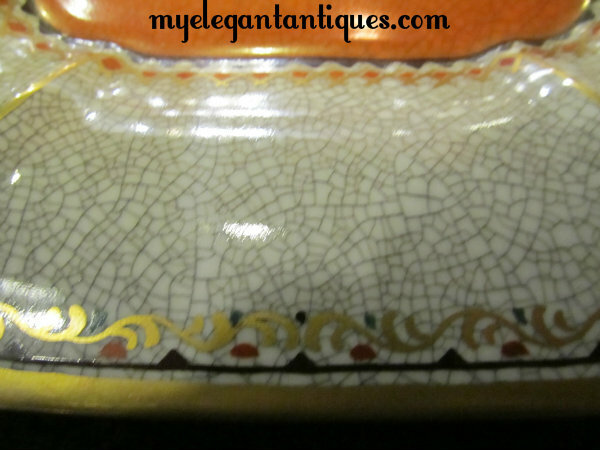 Notwithstanding the elaborate blend of crackle glaze, overglaze, gilding and multicolor stenciling, this lovely piece retains the unique decorative characteristics of its region or origin. 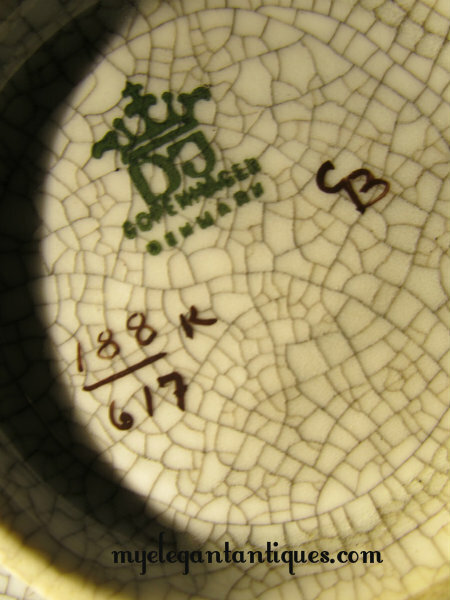 Measuring a generous 10" by 10" (25.5 x 25.5 cm), this bowl is marked with the Royal Crown and DJ Copenhagen backstamp unique to Dahl-Jensen's own manufacturing plant. 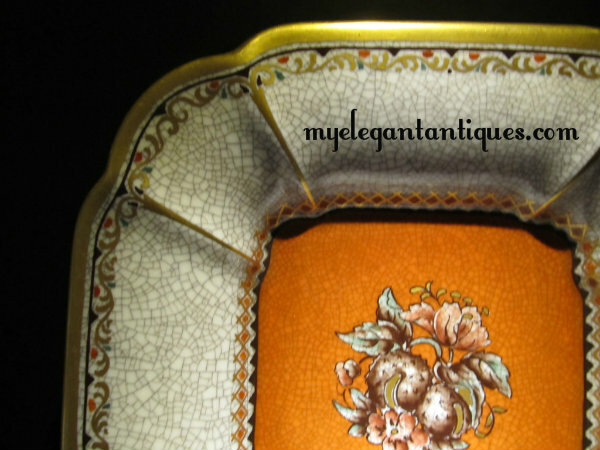 This bowl has no condition issues that we could note, and the gilding is in exceptional shape. 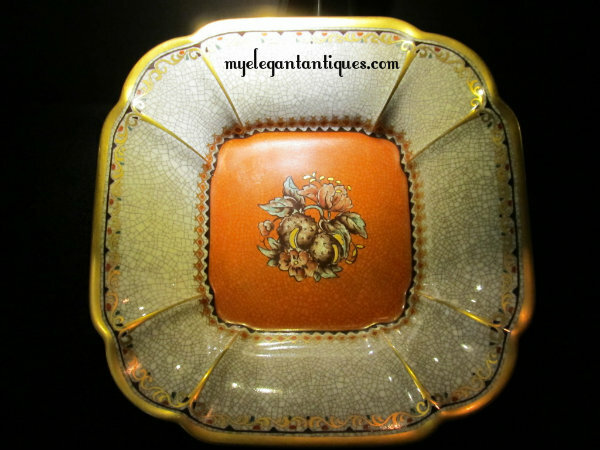 This striking piece would make an outstanding addition to a collection of Dahl-Jensen or Bing & Grondahl porcelain..
Brief background: Dahl-Jensen, born Jens Peter Jensen (b. 1874 - d. 1960) was a gifted Danish sculptor whose work is well-known even though he has been dead for more than 50 years. 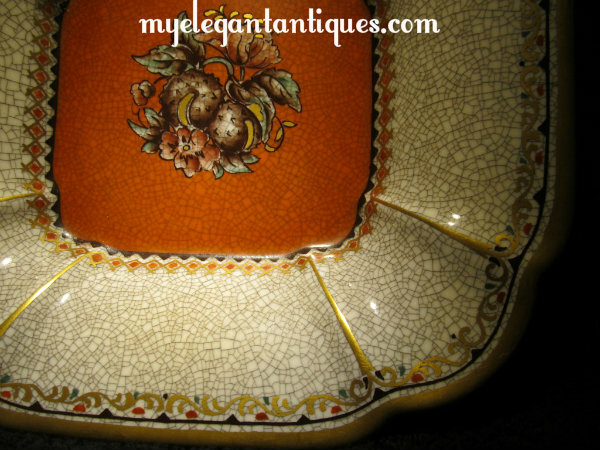 From 1894 to 1897, he studied at the Royal Danish Academy of Fine Arts in Copenhagen, and then from 1897 to 1917, he was the model master at the porcelain company Bing & Grondahl in Copenhagen. 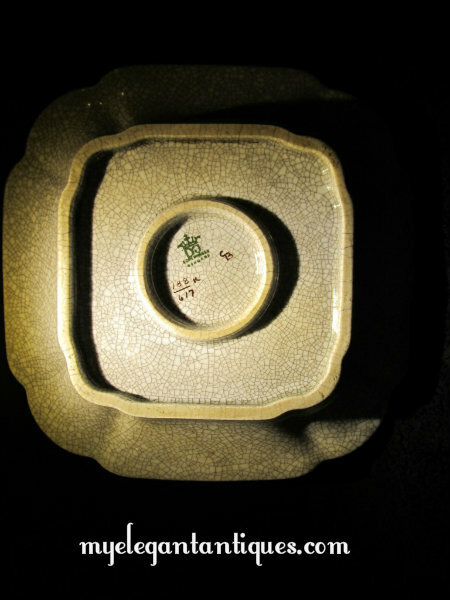 From 1917 to 1925, he was the artistic director of the porcelain factory, Norden, also located in Copenhagen. In 1926 he changed his surname from 'Jensen' to 'Dahl-Jensen'. Dahl-Jensen designed many small sculptures of predators in bronze, but he is better known for his figurines made of porcelain, especially his animal figurines for Bing & Grondahl. Some of Dahl-Jensen's Art Nouveau figurines are still produced by Royal Copenhagen, which purchased Bing & Grondahl in 1987. In 1925, Dahl-Jensen left Norden to start his own businesses, opening one plant in Husum, Germany, and another, the Dahl-Jensen Porcelainfabrik, in Copenhagen. This business venture proved very successful, with the bulk of output exported to the United States and Italy. Dahl-Jensen's wife, Martha, worked in the family manufacturing plant, and son Georg Dahl-Jensen continued production of the Dahl-Jensen line until 1981.